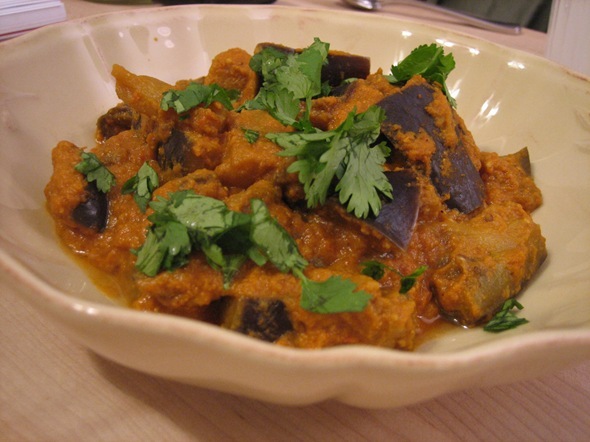 With the season starting to change and the weather turning cooler, I’ve been craving the velvety taste of baingan, or eggplant. So tonight I tried to recreate a dish that my mom makes – eggplant in a peanut sauce. R and I went grocery shopping at the new Whole Foods in Tribeca, which usually has a good selection of produce including some harder to find South Asian vegetables. I picked up a few chayote squashes while we were there. Unfortunately, the baby sized baingans that really make this dish weren’t available, but I did find some larger ones – these were about the size of my hand and the ones I was hoping for are about the size of an extra large egg. I decided to make do, and I think it worked out pretty well. 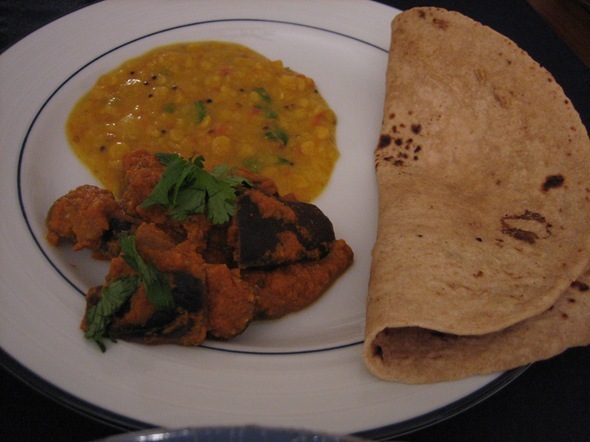 We paired the tangy, rich taste of the baingan with simple dhal and a roti (which, truth to be told was not made at home!). *You may be able to use cashews in place of peanuts. My mom made me write that. Put the peanuts in the food processor. When they are powdered, add the garlic, ginger, onions and then tomatoes. Add all of the masalas and pulse. When everything is fully pulsed and the sauce is smooth, transfer it to a saucepan (one that is not too shallow since the sauce has a tendency to bubble). Add the tomato paste and mix it in well. This gives the sauce a little tartness. Chop the baingans (no need to remove the skin) into matchstick size pieces that are about 1/2 inch long. Add to the sauce, cover and cook on medium-low heat. Cook for about 20 minutes covered until the eggplant is cooked through and looks almost translucent. Be sure to stir occasionally so the bottom doesn’t stick.